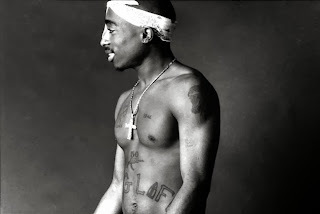 Back in September 2010, we reported that a biopic of the late, great Tupac Shakur was being developed, with Antoine Fuqua (Training Day) on board to direct a script from Oscar-nominated screenwriters Stephen J. Rivele and Chris Wilkinson (Ali and Nixon). The film’s last update came in March when Fuqua told reporters he was still attached to the project and awaiting a finished script. Now, as Deadline reports, the film is finally ready to go into production, but with a new script from Eddie Gonzalez and Jeremy Haft (the latter of which write the iconic Street Kings 2: Motor City and Grizzly Mountain). Principal filming will begin in February 2014 in Atlanta, GA, with a projected budget set at $45 million. Emmett/Furla/Oasis Films and Morgan Creek Productions (True Romance, Robin Hood: Prince of Thieves) have teamed up to finance and co-produce the long-in-the-works project. The film will be executive produced by Tupac’s mother, Afeni Shakur, who has also cleared the rights to Tupac’s musical catalog. At the moment it’s unclear if Fuqua is still serving as director, though it’s worth noting he previously dropped out to tackle Eminem’s ill-fated boxing film Southpaw. Announcements regarding the filmmaker and cast are expected shortly. In the meantime, enjoy a little “California Love”.